I found this recipe for pancake bites on Pinterest. She made them with sausage, bacon, or berries. 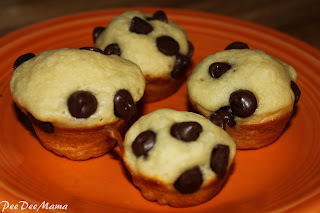 I decided that since my small people like chocolate chip pancakes, I would make some chocolate chip pancake bites. Preheat oven to 350 degrees. Mix Bisquick, milk, and eggs until well blended. Pour batter into greased mini-muffin tin, about 3/4 full. 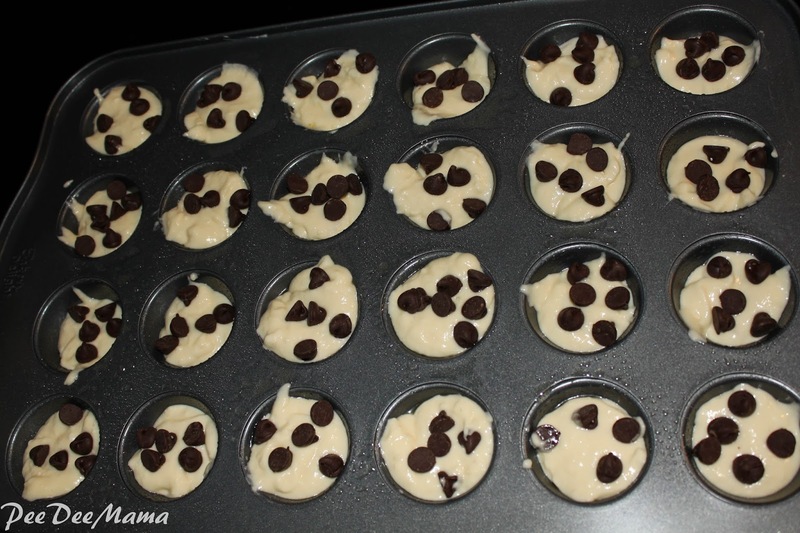 Top with several chocolate chips. (We put 5-6 in each and that was plenty.) Bake for 12-14 minutes. I love how your daughter is already coming up with her own recipes at such a young age! Thank you for the party, have a great Sunday. Thanks for joining us at our Social Sunday. New follower. I like the chocolate chip version way better!!! These sound great! Thanks! We tried it with blueberries, and the kids liked those also. Your chocolate chip version looks delicious. Thanks for following and inviting me to the party. Hi, these pancakes look like something that my daughter would love. I saw it on tasty tuesdays. My kids like them a lot. I like that they're simple and quick in the mornings. Plus I can make a couple dozen at a time, unlike making actual pancakes, which take a bit longer. Thanks for the great party! 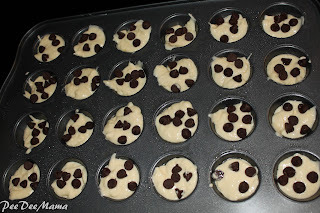 I shared some Diet Soda Brownies :) Love the pancake muffins..my kids would adore them! I would like to invite you to my new weekly linky party Share Your Stuff Tuesdays. It's live now..hope you can join us! Visiting from All My Bloggy Friends. WHat a fun idea! And so many possibilities. Thanks for visiting! You're right - there are so many possibilities you can add to the pancake bites. Visiting from the gathering spot love the recipe will have to try it lorraine at http://lorrainesresources.blogspot.com. Hmm, I'm sure there's a way to make these gluten free. I'll have to ask one of my gf friends. These would be good for traveling - a quick and easy breakfast. What a great recipe! I have shared with my local group! Thanks! Yum! My daughters would like these.